Saturday afternoon, Oct. 3rd, I arrived in Singapore and immediately contacted some of the important people of the Civil Aviation Authority of Singapore [CAAS] who had been very helpful during my last mission in April 2005 on the Island of Nias. I asked CAAS to be put into contact with the Veterinarian Service of Sumatra which they promptly did and this time I had no problem. I faxed them all of Adam's papers and I got permission for my transit to Jakarta for that same evening at 7 30 pm. After handing over my passport and signing the Administration Register, Dr. JUMYDI, the CAAS Vet., allowed me to feed and water Adam and generally make him happy and relaxed. We arrived in Jakarta around 9 40pm and I immediately met Dr. EILY who was very happy to see me and grateful for my offering to help his country. With his assistance the administrative formalities were done in no time and I was told that we were leaving for Padang in a military aircraft at 1am. Just as I decided to give Adam a bit of exercise, Dr. EILY returned with a very good friend of mine, Luigi Usman. He put me in contact with the French Embassy who asked me to report to them on my return. We arrived at Padang around 3.50am. I got in touch with the Authorities who informed me that the Australians, having been the first to arrive, were in charge of Operations and organization of International Aid. From the little I could see, the damage to Padang was considerable. Most well known NGOs were present but I seemed to be the first Frenchman. They assigned me to a group of about 50 Indonesian soldiers whose Captain spoke a little English. At about 9am our group started its' rescue-work on a block of some 20 completely destroyed houses. After several long minutes of broken English palaver I was able to convince the Captain that it was imperative for the dog to be up front so that he could show us where to dig for buried victims. At last I could put Adam to work. We worked all day without him marking a single spot and stopped work at about 10pm. Two of the men helped me get all my gear to their camp. At dawn we put Adam onto a new work zone. 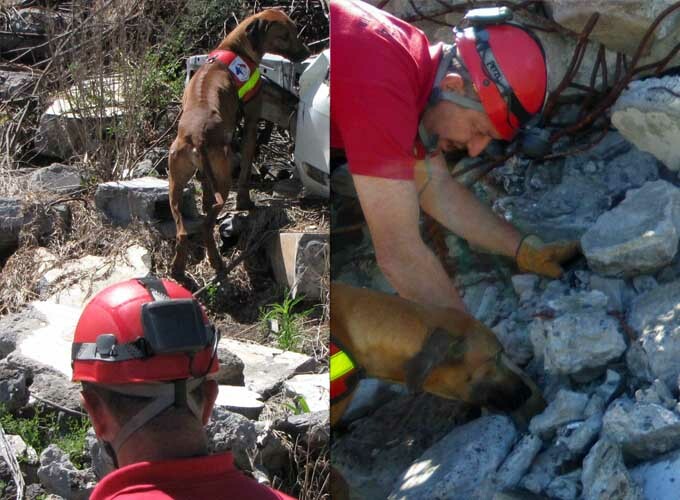 At about 10am he leapt across a pile of wood and iron debris, cleared it by 2 m and made a sudden turnabout, returned to the pile of rubble and marked the spot without barking. As I got close I could smell a strong odour; I put Adam back on lead and called over the rest of the group. After 1½ hours we pulled out a dead man. The Captain came over to me, took my hand in both of his and congratulated Adam “Good dog! Good dog!” He held up his thumb and tapped me on the shoulder. I suppose that after yesterdays' unsuccessful search he needed to be reassured of Adam's efficiency. How could I tell him in my bad English that an unsuccessful search was also efficient as one could be reasonably certain that in that sector there were no people buried and one could therefore move on and possibly save lives else where. Around noon we were told that the French rescue delegation had arrived with several tons of rescue material and a field hospital but no dogs. Only the British and the Australian search- dog teams were present. Around 3.20pm, at 150m from the first victim, Adam marked a second time. After 4 strenuous hours, without the help of a bulldozer, we pulled out another dead man. While we put the body on a stretcher another earthquake occurred, quite strong but luckily without consequences. Due to the earthquake and our general state of exhaustion the Captain decided to stop the search for the time being and to go back to camp. As soon as I put Adam to work, for some then mysterious reason and despite 3 counter- orders, he dashed across the street and more than 200m away from us literally threw himself into the rubble of a collapsed house. After running back and forth he started scratching and digging madly, all the while whining loudly. He was very excited; never had I seen my dog like that before! He was trying to get under the debris by all possible means. We rushed over to him stumbling over the loose rubble and the first soldiers there said they had heard voices. I had great difficulty in controlling my dog so I decided to take him back to camp in his travelling kennel, give him water and try to calm him down. When I got back to the site the Captain informed me that he also heard voices coming from the rubble. No more time must be wasted. It took us 6 long hours to pull out 7 victims - 2 dead men; 4 children between 5 and 12 years of age and a woman, all seriously hurt but alive. I asked the Captain to allow me to show them to Adam and without waiting for an answer I rushed to get my dog. When I got back a doctor was attending them and I waited till he was finished. Adam again was very excited. I let him slowly approach the children and when he got close to them he started frantically cleaning their little faces; suddenly the children started to laugh and one of them put his arms around Adam's neck, pulled his head close to his and hugged him. The wounded woman was less enthusiastic so I held Adam back. All 5 were taken away on stretchers and whisked away in 2 ambulances. When we got back to camp we had the pleasant surprise of seeing a water tanker that had been set up for us. Our first shower since our arrival! I was very proud of my dog. I gave him an extra ration of food with rice and sauce over it from my own meal. He certainly deserved it; he had been a very good dog. A fruitless day except for the many identity papers and other documents that we found each day and that the Captain will hand over to the local Authorities at the end of our mission. During the morning Adam very slightly signaled a place in the ruins of a concrete building whose several floors had collapsed. Luckily a bulldozer was working nearby and with its' help we were able to recover 2 bodies trapped under a concrete block in under 3 hours. Early morning Adam clearly marked a spot without barking. In less than an hour we pulled out a dead girl. In the afternoon we were working on a concrete and brick building; Adam marked again, this time whining and visibly upset. I almost had the feeling he was crying. After giving the dog a rest we cleared the entrance and went into the collapsed building. Very carefully we proceeded through the debris of broken furniture while the rest of the group watched out for signs of danger - the rubble could collapse at any time. Suddenly behind a wall I saw in the beam of my lamp a young girl impaled by a metal girder. The sight was horrible! Yet, we had to get her out so her family could mourn her. After pulling ourselves together we decided to fetch something to prop up the vault and also some tool to cut through the girder. We came back with a disk saw and some wooden posts. It was most important to stabilize the rubble to make a safer place to work in -it might well have been the girder through the girls' body that was holding everything together. That job done then we had to cut the girder to free the body of the poor girl. As no volunteers came forward I did the grueling work myself. It took over 2 hours in a very uncomfortable position and I used up 2 disks. I then asked one of my companions to return the saw and come back with a body bag. We had to remove the girder from the girls' body to put her into the sac and carry her outside. We had hardly left the building when we felt the ground shake and with a deafening roar the whole building collapsed behind us. Evidently our time had not come yet! Just before dusk Adam signaled in a cellar of a wooden house. Around 1am we freed the corpse of an old man. We were at the end of our strength; Adam had no energy left, I had no more dog food for him and all the International Aid Organisations were now present so I decided to leave and asked the Captain to have somebody take me to the airport. He came to me, hugged me, took my hand in his and again “thumbs up” said “thank you, good dog very good dog” and all the men came over to say goodbye. 14 people recovered of which 1 woman and 4 children alive. Back home we washed and went to sleep till Monday morning.